Need help building a custom box for a boat! I am trying to build a custom sub/speaker box for my boat. I have never built a custom box so I could use all the help I can get. I'll post pictures of the existing box that I'm planning on replacing. It is going to be the base for the rear seats, so one of my major concerns will be moisture as wet people will be sitting on top of it. I am planning on 2 6" speakers on the ends and 4 10" subs in the center. I will be running a 2 channel amp for the subs. Will the box need to be ported or is sealed better? Does each sub need to be sealed or can 2 go on one side and 2 on the other? Next question, what kind of wood should I use and what is the best option to waterproof it? I was thinking bed liner but I'm open to options. 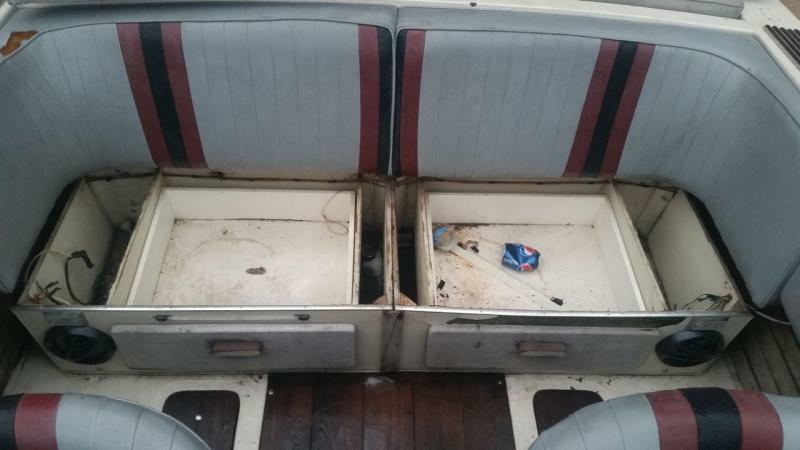 I plan on having the box wrapped in upholstry as I'm having the whole boat reupholstered, so looks aren't much of a concern. Need two tens for boat. Quick Reply: Need help building a custom box for a boat!